Starting with appearance, the Bolt EV was definitely at the bottom of this category and the Model 3 was easily at the top. Running a distant second would actually be the Focus Electric, which I have grown to appreciate for the fact that it doesn't look like a typical EV. The e-Golf comes next followed by the new Leaf, then the Ioniq. The odd proportions and dorky appearance of the Bolt have it coming in dead last. Performance is next and here, the Bolt acquits itself well. Performance wise, only the Model 3 is able to out-pace the Bolt. Nissan's Leaf 2.0 is theoretically next, but without any real-world numbers, there is little way to be certain. The Focus and e-Golf pack about the same amount of power and should both outpace the Ioniq, which is the slowest of the bunch and if our experience in previous Hyundai's is any indication, it will be the least fun to drive by a wide margin as well. But with an EV, we cannot talk about performance without talking about efficiency, where the Bolt's 119-mpge combined rating comes in mid-pack, topped by the hyper-efficient Ioniq and Tesla's Model 3. The e-Golf leads the Focus, which is the least efficient of the bunch. Since Nissan's Leaf 2.0 has not actually hit the market, it is hard to say for certain what it's numbers will actually be, though early information seems to point to it being only nominally more efficient than the current version. Of course, efficiency without range means little. And here, the Bolt is king. With an EPA-estimated 238 miles from a 60-kWh battery pack, the Bolt simply shines here without question, edging the Model 3 by about 5% while the rest of the cars are simply not in the same league. Nissan's 40-kWh battery for the Leaf was a mistake, in my opinion, as it's 150-mile range in a world of 200+ mile EVs is simply going to be a difficult hurdle to overcome in the showroom. Interior room is another area that the Bolt delivers in spades. It is roomy and comfortable for 5-passengers while still being able to carry a decent amount of stuff in the back. The Model 3 theoretically would be next, though not being able to actually get into the car to experience it makes it difficult to be sure, though the possibly compromised cargo room of the Model 3 is problematic. Nissan is the only other car built on a dedicated EV platform, but its smaller size means overall space is less, though it supposedly has a pretty large cargo space. At the back of the pack is the Focus, which suffers from having its battery shoe-horned into a platform designed for an internal combustion engine, which results in a severely compromised trunk area due to placement of the battery. Technology is another area that is important to me and here, the Bolt EV has a lot going for it, like the available surround vision cameras, video rear-view camera, lane keep assist, forward collision warning, blind spot monitoring, and standard Android Auto/Apple CarPlay integration. The conspicuous lack of adaptive cruise control of any kind is a rather notable oversight. The Model 3 has its AutoPilot features, but the lack of smartphone integration and the possibility of being a beta tester of unproven technology is both exciting and problematic. The e-Golf has the VW Virtual Cockpit, which is one of the coolest gauge clusters on the market, but the fact that it is not even available on early cars and there is no clue on actual availability makes it a non-starter. Nissan is coming to the market with its ProPilot features, which are notably similar to Tesla's AutoPilot, though they are as yet unproven. Hyundai's Ioniq has just about every feature possible, except for Lane Keep Assist, which was deleted from North America-spec cars for some unknown reason. And conspicuously lacking any advanced technology features is the Focus, which is long overdue for a ground-up redesign. But all of this is pointless if the cars are unaffordable. Due in large part to the fact that it trails everyone else in just about all categories, the Ford Focus Electric sees some insane incentives, bringing 3-year ownership cost, after all the available rebates, of course, down close to $5,500. 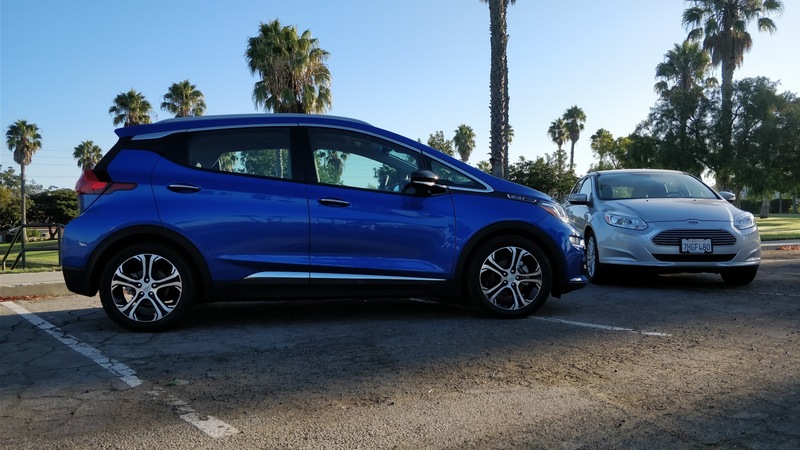 The Bolt EV has been on sale in California since the start of the year and a glut of inventory meant great deals could be had, especially on leases. The total cost of ownership for 3-years on the Bolt EV Premier is around $8,500. Hyundai's Ioniq has some great lease rates and includes a subsidy for charging, but with a higher upfront cost and no room to negotiate. Being new to market, the offers on the e-Golf and Leaf remain to be seen, though I expect fully loaded versions of both cars to be more expensive than the deal I was able to work out on the Bolt. And finally, Tesla's Model 3 does itself no favors by having no lease options available currently or even on the horizon. Third-party leases have returned rather unappealing numbers owing to the cars high price tag. And all of this is moot if I cannot get a car by the time the lease is up on our current car. As of the writing of this piece, only the Bolt EV and Focus Electric are readily available. Hyundai's Ioniq and the VW e-Golf have suffered, for different reasons, from limited availability that has likely angered many potential buyers. The Leaf 2.0 was only just announced and won't be available until early next year. As for the Model 3, my current reservation shows a delivery date between December and February, too far into the future for me to rely on it as an option. So taking all of those factors into consideration, if I take out the subjective factor of appearance, the Bolt EV provides the best balance of range, performance, room, technology, and cost while also being readily available. Since we were able to negotiate a great deal, it made the Bolt EV the smart decision. For pretty much the same monthly payment we have currently on the Focus, but with no money out of pocket, we got a fully loaded Bolt EV Premier in Kinetic Blue Metallic. For the same money, we got a car with 3x the range, way more tech, DC fast charging, and significantly more utility. That is a logical decision that I cannot really argue with. Over the next three years, we will see if I can overcome the looks of the car and focus on its positives, but so far, the Bolt has done a good job of convincing me it was the right decision over the Model 3.